“It never rains, but it pours” is an English expression which means that when troubles come, they all come together. This week the phrase might have been applied literally to the deluge we experienced in East Kent. Dramatic thunder storms on Monday night were followed by almost 24 hours of persistent, but very welcome rain. Window boxes and containers that were dry and wilting on Sunday quickly became saturated, which must have come as quite a shock to the parched plants growing within. There are four consequences of heavy rain following a period of drought in summer: the rapid emergence of hoards of marauding molluscs; a Wehrmacht of weeds following on behind; flattening of plants that have enjoyed too much of the good life; and furious rates of growth. I ignored the forecast on Sunday and pressed ahead with watering, which equates to five hours of my life that I will never get back. Mollusc-wise I came off lightly. Snails and slugs cause much less damage to mature plants, and will often sate themselves with leaves and flowers that have fallen to the ground. Years of picking off and ‘relocating’ the little blighters has reduced, but not eliminated, the problem in my garden. The trick is to never give in. 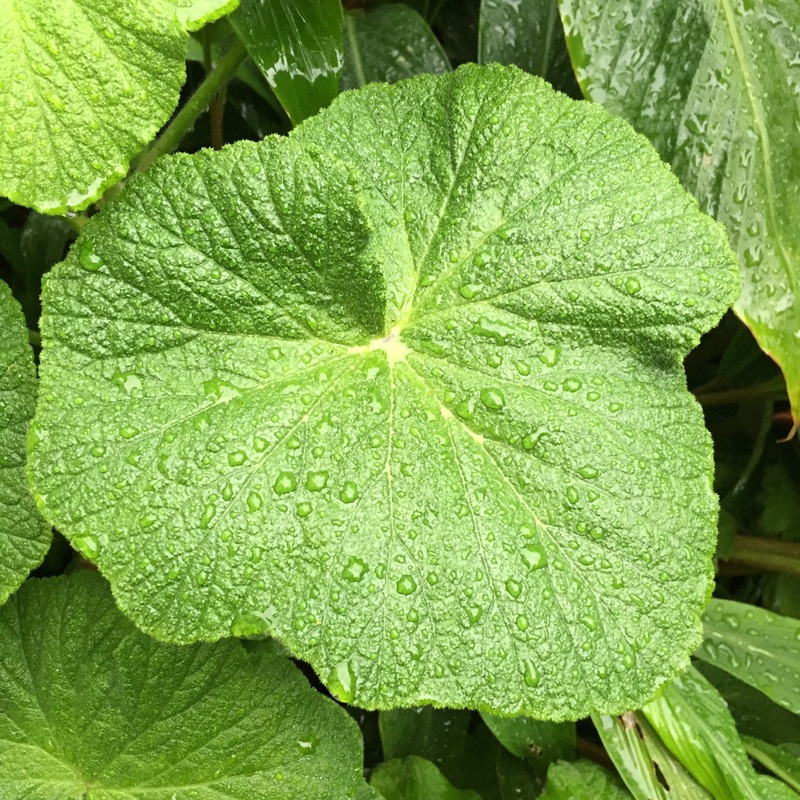 Weeds, however, have a stealthy way of appearing a few days after the rain when one’s guard is down, quickly colonising any patches of bare earth. I make a habit of not creating such opportunities, but where I have recently planted a long row of pinks there is already an ominous strip of pellitory of the wall (Parietaria judaica). I know I should love all plants, but in this one it is hard to find any virtue. It is persistent, finds its way into any nook or cranny, is weedkiller resistent (one might tame it after three or four attempts), is beloved by molluscs as a hiding place, has extremely irritating pollen and spreads like wildfire. One year’s seeds most definitely equates to seven years’ seeds in this case. 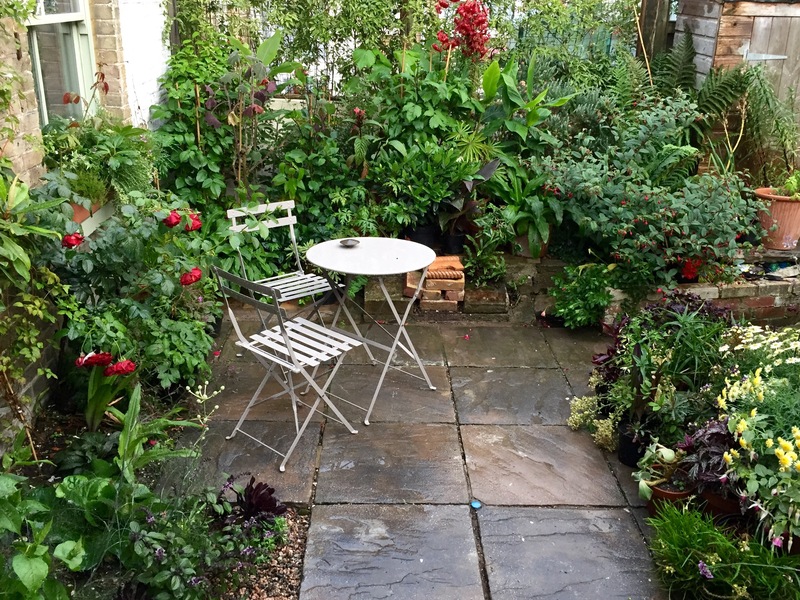 It is tempting not to stake or tie-in plants when they appear to be supporting themselves adequately, but this is usually a mistake, especially if you live in an exposed location as I do. Plants that have done most of their growing during fine weather may not have developed sufficient strength in their stems to stay upright in wind and rain. As in humans, the toughest specimens are often brought up in the most challenging conditions. When it comes to providing support, prevention is always better than cure. Don’t leave it until you have to go out in a storm and wrestle with a wet, writhing tree that’s already at a 45º angle. I’ve been there, and it’s not funny. As well as deadheading, do keep on top of debris that’s dropped to the ground as it can turn into a haven for pests and diseases. When it’s warm and humid most plants will grow like topsy if regularly waterered, especially those from subtropical climes. My gingers, dahlias and fuchsias have reacted as if they’ve been given steroids, producing bigger, lusher leaves and lots of buds. I watch out for any that are becoming top heavy or at risk of collapsing under their own weight. It does not hurt to trim leaves, stems and branches that are making a composition unbalanced. I do this regularly to prevent the most ambitious plants taking over. Two days later I read a press release suggesting we are in for a hosepipe ban. If that comes to pass I will be unphased, as I tend to water using a can rather than a hose. Many plants have already achieved their optimum size so don’t need to be encouraged to grow further. With sun and warmth come flowers, and with flowers come scent and smiles. Wishing you a lovely weekend ahead. TFG. It sure does. In a couple of weeks there will not be room to swing a cat. I quite like it like that …. for a while. Have a lovely weekend Judy. Watering is such a pain, so time consuming, but necessary. I have a drip irrigation system but haven’t got around to fitting the timers this year. Your advice on staking is a timely reminder, i have some helenium which I was lucky survived the rain mostly intact. Lush! I purchased a drip hose last year and never got around to installing it. I find watering quite therapeutic, only not in a rush, which I normally am! Get those heleniums staked before the next storm knocks them flat 😉 Have a super weekend. It’s a horror Sam. I control it as best I can, but it comes back from all the gardens where they don’t bother!